This is actually awesome. (At least I think so XD). Up to now we had to use the json-localization-plugin included in MvvmCross. As I do not like to edit json and I guess any translator does not like it as well, I prefer the resx-stuff. In this blog-post I do want to describe how to use resx-Files all around your Xamarin.Android/Xamarin.iOS and Windows Phone 8 Solution (do not target WinRT and WPF, but they should actually be a nobrainer as they use resx by default :-)). At this point, thanks to Jonathan Pryor for the awesome support on this! 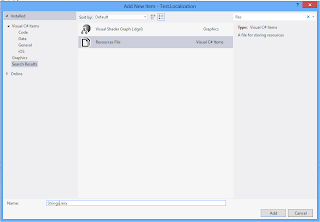 Add a reference from each project where you need the localization to this new pcl-project. Add a single resources-file. I called it "Strings.resx". Add a second Resource-File called "Strings.de-DE.resx"
Make sure your first resources-file has the visibility-modifier set to public. Otherwise we will not be able to see the resources from any other assembly. All the additional translations do not need to generate the code. This means you can set them to "No code generation"
Step 3: Add a new class "ResxTextProvider" to your Core-Project. Here is the point where we pass the ResourceManager from our generated String-class to the ResxTextProvider. In this example I do not pass a Namespace to the MvxLanguageBinder. 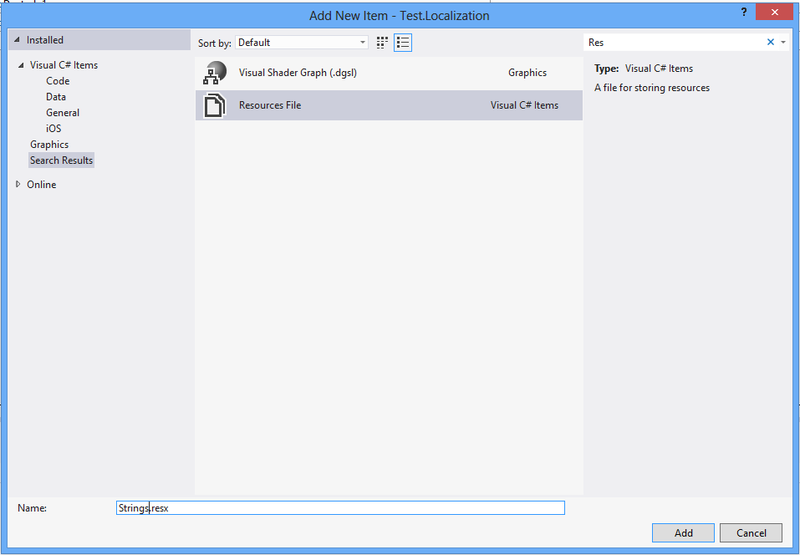 This means that the GetText-Method of our ResxTextProvider is always called with an empty first parameter. The second parameter will be the current Type. As we are in the MainViewModel, this well be "MainViewModel". Step 7: Start using MvxBind in your android XML-Code. Her is not that much to do. Simply use the MvxLanguageConverter to bind the TextSource to the Label (or whatever) and set the resx-key as CommandParameter. All that done, move ahead to Windows Phone. Hey Stefan, good work with this. I'm facing one issue, not sure if it's my fault or something that is not implemented, but I'm not able to load .resx files without country code. For example, modifying your example and adding a Strings.es-ES.resx works fine, but adding changing it to String.es.resx shows the English value. On which platform does this problem occur? I've been testing Windows Phone mostly. On iOS I didn't get it to work. What is not working on iOS? Errors? Thanks Stefan. Further testing on iOS simulator shown that it uses the region format instead of the phone language. Setting the region format and resetting the iPhone simulator shown the same behavior that WP. Ou crap.. missed that in my blog, sorry.. But when the behaviour on WP is the same.. hmm.. really have to check this by myself on my test-project! Hey Stefan, this is great. Will come handy. For iOS, instead of creating a new instance of the converter, you can register it as well like you did for Android. I am used to using RESX files with .NET however that meant I fell into the trap of adding my strings as "Test1" rather than "MyViewModel.Test1". I really appreciate your work on this but would ask that you make it obvious that you will be required to add an "Invalid Identiifer" and that you need to prefix your string with the ViewModel type. I know that your screenshot shows it but it is very small and I did not zoom it because I thought "I know how to use RESX files". Also wanted to add (for others reading this) if you wanted to added Strings that go across ViewModels. I could not get this to work for iOS.